You can only wonder what David Lee is saying to Pat White in this picture at Miami's rookie mini-camp. Is it... "OK, here's the play, if you feel the desire to run, then RUN! LOL!" Or, maybe the entire wrist coach Pat is reading off says in real big letters: DRIVE THE DEFENSE CRAZY - Wild-Cat, Wild-Pat, Go Wild! I hope the other teams have great cornerback's, because if the safeties creep into the box, Pat can beat you on the pass! 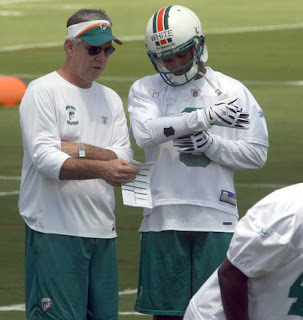 Whatever the plans are down in Miami, I'm sure they'll be doing just that... driving defenses nuts with Pat White in the spread offense in the NFL. 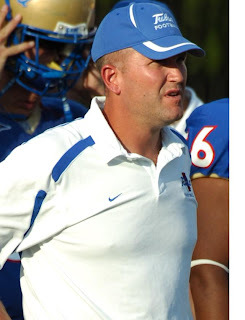 Last year we did our first coaches Q&A with Herb Hand, Co-Offensive Coordinator at the University Of Tulsa Golden Hurricane. It's our pleasure to offer our second installment with Coach Hand, as he offers more insight on the team, and the spread offense in general. Tulsa is coming off an 11-3 season in 2008, and their spread offense is one of the most dynamic, explosive, and creative in college football.